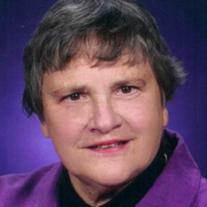 I got word tonight that my undergraduate advisor, Bonnie Litwiller, passed away a couple days ago at the age of 74. As a freshman at UNI, I had a temporary advisor until my program became more certain. After declaring as a math education major, Bonnie Litwiller was assigned as my advisor. I knew nothing about her. I remember asking Ed Rathmell, whom I had gotten to know while applying for a scholarship, what to expect from Litwiller as an advisor. I remember his response: "If you listen to her and do what she asks, she's great. She'll have your back when you need something. But don't cross her." That's an uneasy way to know someone before you even get a chance to meet them. It felt like a description more fitting of mafia boss than a professor. But Rathmell's advice, as usual, was solid. Litwiller proved to be tough, and she made it clear to us that being a good math teacher was hard work. She set a good example: she and her research partner, David Duncan, would set aside a day a week where they'd lock themselves away in the library and write. As UNI isn't a top-level research university, the research activities of professors aren't always visible to the students. But Litwiller's dedication to research was clear, and there was no topic too small or journal too obscure. If she thought she had knowledge that would improve the teaching and learning of mathematics somewhere -- anywhere! -- she would write and submit for publication. She continued to write and publish even after her retirement from UNI in 2000, eventually passing the almost unfathomable mark of 1000 scholarly publications. I took two classes with Litwiller, Teaching Middle School Mathematics and Teaching High School Mathematics. The classes were tough due to Litwiller being both picky about the quality of our work and her lack of clarity in describing what she wanted us to do. Some of us thought she was just being careless with her assignments, but I always wondered if this wasn't somehow purposeful. Either way, it was clear that she didn't want to do a lot of hand-holding. Some of us, ever so quietly yet respectfully, referred to her as the bulldog. A trusty companion that might just bite if you got out of line. If you didn't have the initiative and sense of responsibility to do quality work, I think she wanted a way for you to sort yourself out of the program. It happened, too; every semester some classmate would go missing and we'd try to find out what happened. Inevitably, someone would say, "They couldn't cut it. Litwiller dropped them from the program." You hear a lot today about colleges adopting GPA or test score requirements to improve the quality of their education majors. We didn't have those -- we had Litwiller. And just like letting a GPA decide who can be a teacher, I'm sure her judgement wasn't perfect and mistakes were made. (An acquaintance of mine, who shall remain nameless but now holds a PhD in math education, told me about a narrow escape from Litwiller's axe after a dispute over access to a local school.) But I think Litwiller had a sense for the quality that people expected from a UNI-prepared teacher, and a sense for giving us some survival skills that would get us through our first few years of teaching. There must have been far more successes than failures, too -- by the time I graduated in 1999, someone had estimated that a quarter of all the math teachers in the State of Iowa had been taught by Bonnie Litwiller. My appreciation for Litwiller and her work has grown through my years first as a teacher and now as a graduate student in mathematics education. It was she who first introduced me to the NCTM Standards, and her direction of the NCTM Addenda Series was and still is an enormous contribution to the field of math education. What I believe was originally intended to be a six-book series to support the Standards grew into 22 total books, each designed to take the research behind the Standards and turn it into something teachers could use. Litwiller might have been the director and not the author of the Addenda Series, but it carried her trademark: getting as much useful information into the hands of teachers as possible. She gave me two books from the series, the middle school and high school books about statistics and data analysis. It was the first time I really thought about statistics education, and it's since become the area of school mathematics I find most interesting. The world will miss Bonnie Litwiller, but she didn't leave without making a mark, both on the field of mathematics education and on me. Teacher education is a challenging business, and it's probably best to judge it with a certain amount of hindsight. For all of her toughness, she did have my back when I needed it, just as Ed Rathmell said she would. I may not have learned all that she tried to teach me, but maybe her most important lessons -- a sense of dedication and rejection of "good enough" -- have been most helpful in getting me to where I am today.